Home » Website Building » SEO » How to Add and Verify Site in Baidu Webmaster Tools? How to Add and Verify Site in Baidu Webmaster Tools? Baidu is the popular search engine and number one traffic ranked site in China. Baidu predominantly offers searches in Chinese and also offers English searches in partnership with Bing. Baidu also offers webmaster tools to enable webmasters to monitor various site parameters and performance in Baidu search engine. The problem is currently Baidu Webmaster Tools is only available in Chinese which makes webmasters a bit hard to add and verify their site. Here we eliminate the hassle of translation for webmasters and explain how to add and verify site in Baidu Webmaster Tools account using English notations. Learn more about Baidu Webmaster Tools features here in English. Click here to login to your Baidu webmaster tools account. You may need to register for a new account in case if you do not have an existing account. Check out our article on submitting site to Baidu. Once you login to your webmaster tools account, go to the second option under first section (Site Management) as shown in the below picture. Here you can see the “Add New Site” button. Click on the “Add New Site” button and you will be taken to the next screen asking your site URL. Enter your site URL and click OK button. Remember to enter correct URL of your website, for example “www.webnots.com” and “webnots.com” are two different sites from webmaster tools perspective. You can check it by opening your XML Sitemap in a browser with and without ‘www’ and use the correct site for which Sitemap exist. After adding your site you will get a popup providing you the options for verifying your site. Site verification is mandatory in order to access site specific features in webmaster tools account. You have three options to verify your website with Baidu webmaster tools. File Upload – Download the verification file and upload it into your website’s root directory. HTML Tag Verification – A common method, copy and paste the HTML code into the header section of your website. CNAME Settings – Copy the CNAME record and set it in your site’s DNS settings pointing to zz.baidu.com. Once you completed any of the verification method then click the “Verify Now” button. You can also cancel the verification and verify it any point of time later. 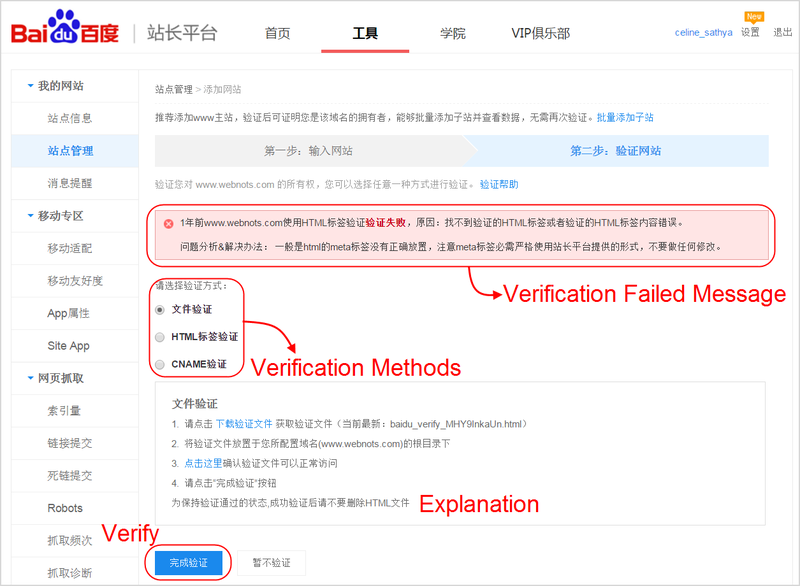 Even though Baidu recommends to wait 6 hours for the verification, it will normally take only a few minutes after you published your website. In case of verification is failed you will see a message after clicking on the verify button, this means you may need to wait for some more time before you click on verify again. Where to Paste the HTML Site Verification Code? It is important to paste the HTML code correctly in your site to verify your site in Baidu Webmaster Tools. Below is the suggested example showing how to paste the code between tags. You need to paste this verification code in-between the header section of every pages of your site in order to monitor the performance of every pages of your website. File Upload and CNAME settings need administrator access to your site’s root directory which means you should own the top-level domain of your site whereas HTML tag verification method does not need access to root directory. Once your site is verified it will be automatically added to your Site Manager. Site Manager shows the complete list of sites under your webmaster tools account along with other details. You also have an option to delete your site any time from Baidu webmaster tools account. Learn here how to get Baidu Search Box Code for your website. Baidu webmaster tools generates unique verification code for each site added unlike Google and Bing Webmaster Tools where one single verification code can be used for all the sites under one account. I tried the html verification, of a https URL but it says, “does not support https site verification”. And it redirected me myschooltutorial.com (translated via Google). What can I do? Nice article… you explained very well. though it is very old submission method because new method is quite different however you update your article on May 11, 2017, which I appreciate. I think you should check the method of submission once again. Site field submission failed Please try again later. if you are aware how to solve this, please let me know …this could be a great help to me. Baidu changes the submission method every few months and stop all ways for international sites outside China. For WordPress sites, you can try with the plugin for others we do not see the meaning. Try the CNAME option of submit. It should work for your case. My host provider is Bluehost and it is asking me to enter the host record. I am not sure if its just the series of numbers and letter or do I also add my url to the host record. Editorial Staff kindly solve my problem i am getting this error. Less than a minute ago knowingalot.com use html tag validation validation failed , reason: not find the verification or validation of html tag html tags an error. You need to wait sometime for verification. You site has the meta tag so it should work, if not then follow DNS CNAME verification which should always work. 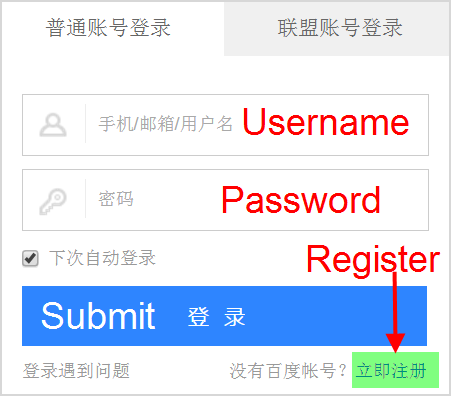 How can I create account in baidu if i’m not a chinese? You don’t need to be a Chinese for registration but SMS verification may be required during registration and all country codes are not listed in the drop-down. If your country is in the drop-down then you should be able to register. I tried the html verification, of a https URL but it says, “does not support https site verification”. (translated via Google). What can I do? Baidu does not index HTTPS sites. The only way is to create a duplicate HTTP site and allow Baidu spider to access it and redirect it to HTTPS site for users. What do you mean under “redirect it to HTTP site for users” ? May it be defined/evaluated as cloaking? Also, what about HSTS? May I use to for my site to be crawled by Baidu spider? Thanks. The CNAME option appears to have worked! DNS verification is the recommended method by Google also, since it will be kind of permanent till the time your domain expires. Thanks for a great article. I have tried to submit my site to Baidu several times. I always receive the same message : “Verification fails Reason: cannot connect to web server.” I have contacted my webserver Webs.com/1.0 (OS Linux) but they can’t help. Do you have any ideas? Did you try the option of CNAME entry in your DNS settings? This can be done with the domain registrar DNS zone editor without relying on free hosting.